Originally posted: July 29, 2017 . Last modified: December 10, 2018 . This Homemade Caramel Sauce recipe makes a great topping for ice cream and desserts. It’s rich, buttery, and even makes a sweet gift idea. Every home cook needs a good homemade caramel sauce recipe. I have a couple, and this is one of them. This recipe doesn’t start out with candy caramel squares. Instead, it’s made entirely from scratch with sugar, butter, and heavy cream. The result is a sweet, buttery sauce that is tasty enough to be eaten right off the spoon. However, it’s really meant for as a gooey topping for your favorite treats like ice cream, cinnamon rolls, or maybe even bread pudding but eating it from the spoon is just as good. When I first started the blog over a year and a half ago, my goal was to make every single recipe from scratch. No shortcuts, no boxed mixes, well, you get the picture. However, things have changed a bit during that time. If you’ve read some of our other posts, you know that both John and I have some health issues that limit how long we can stand and cook. Therefore, we’ve had to adapt things a bit. 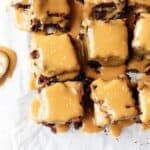 There’s a different caramel sauce recipe I use that shortens the cooking process, and I’ll share it with you a different day. For now, I’m excited to tell you about my from scratch recipe that still works wonderfully when I’m in a pinch and don’t have all the ingredients for the shortcut recipe. There are several variations of this recipe. Some use brown sugar instead of granulated while others use sweetened condensed milk instead of cream. This homemade caramel sauce keeps best when stored in the refrigerator for about a week. It reheats well when microwaved on medium heat until warm. Some of our favorite serving ideas are to use it for a dipping sauce with apples, caramel topping for bread pudding, or use it in another dessert like carmelitas or brownies. Ooey, gooey, sweet, and buttery. That about covers it when describing this homemade caramel sauce recipe is made with just 3 ingredients. Pour sugar into a heavy bottomed saucepan on low-medium heat. Stir constantly until sugar begins to melt. Continue to stir. Sugar will begin to form hard lumps and eventually turn amber in color. Stir until all lumps dissolve then carefully add all cold butter. Sugar will immediately begin to boil. Stir for 3-4 minutes until sugar and butter are combined. Add the heavy cream. Mixture will boil again, so use caution. Mixture will thicken and pull away from pan, but continue to stir until mixture smooths out. Allow caramel sauce to cool before storing in an airtight container or glass jar. Keep in the refrigerator for up to a week. *It is helpful to prepare ingredients ahead of time. Cut butter into cubes and place back in the refrigerator so they remain cold. Measure the heavy cream and place it back in the fridge so it also remains cold. Use caution while making this recipe. Sugar burns can be very dangerous. *This recipe has a heavy butter flavor. Cut back the butter 1/2 to 1 Tablespoon to remove some of the buttery flavor if desired. Guys! This looks delicious! I love simple caramel sauce like this. I won’t lie, we love it on pancakes. I know so bad, right? I’ll definitely be trying this recipe soon. Thanks for sharing! Thank you, Rachel! I appreciate your comments 🙂 I have never tried it on pancakes before, thanks for the idea! I would not have thought to make this at home, I am sure that this tastes better than store bought. There is nothing better than homemade especially with sauces like these. Caramel sauce takes five minutes to make which is why I have never ever purchased it. This looks so good. Love the deep rich color you have here. This caramel sauce looks so good I’m literally drooling looking at your photos! I’ve only made caramel sauce one time and I have to say it is truly worth it! Nothing beats homemade in our opinions, and this recipe is a keeper. I’ve made some lately at a macaron baking class, with a recipe similar to yours. I still have some in the fridge. Pretty easy and so delicious. I agree – every home cook needs to have their own homemade sauce recipe. And soup recipe. And salad recipe. And drink recipe… I guess there has to be one signature dish in each category 🙂 BTW, the sauce is amazing! Thank you, Elaine! Agreed, everybody should have his or her signature dishes. Have you ever tried to a vanilla sweet cream sauce? It’s so tasty! I haven’t published it yet because our sauce recipes are hit or miss in terms of popularity. But, maybe one day. Thanks again for commenting, have a wonderful weekend Elaine! There is nothing better than homemade and your sauce is no exception. It looks delicious and so reach and smooth. What a perfect topping for ice cream, pie or even a pound cake. I can certainly think of so many ways to use it. I’m pinning the recipe. Yum! It would be dangerous for me to have this around but I think I’m going to have to try it! WOW! That looks amazing. I could eat it with a spoon, but I think I will put it on my ice cream. Delish! !